Tuxedo® is formulated with patented technology to ensure essential micronutrients are available for immediate plant uptake, nourishing crops as they germinate. It’s compatible with most standard insecticide and fungicide seed treatments, and can be applied simultaneously. Tuxedo is recommended as a pre-plant seed treatment for use on cereal and pulse crops. Recommended use rate is 2.0 fl. oz. per 100 lbs. of seed. Tuxedo Soybeans can be used on (but is not limited to) the following seeds: soybean, pea, lentil, garbanzo/chickpea, dry bean and other pulse crops. Tuxedo Cereals can be used on (but is not limited to) the following seeds: wheat, barley, cereal rye and rice. See label for full list of registered seeds and application rates. 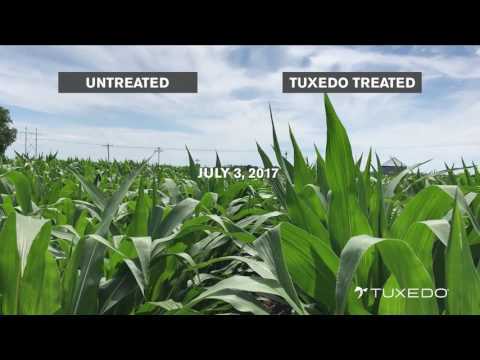 Tuxedo is compatible with most standard insecticide and fungicide seed treatments. It can be applied at the same time. However, Verdesian recommends a jar compatibility test prior to mixing Tuxedo with other seed treatments.